In Chemistry 131C, students will study how to calculate macroscopic chemical properties of systems. 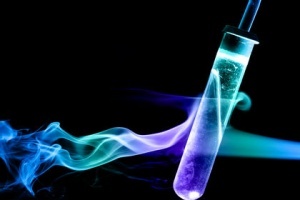 This course will build on the microscopic understanding (Chemical Physics) to reinforce and expand your understanding of the basic thermo-chemistry concepts from General Chemistry (Physical Chemistry.) We then go on to study how chemical reaction rates are measured and calculated from molecular properties. Topics covered include: Energy, entropy, and the thermodynamic potentials; Chemical equilibrium; and Chemical kinetics. Penner, Reginald Thermodynamics and Chemical Dynamics 131C (UCI OpenCourseWare: University of California, Irvine), http://ocw.uci.edu/courses/chem_131c_thermodynamics_and_chem... [January 28, 2015]. License: Creative Commons Attribution-ShareAlike 3.0 United States License. (http://creativecommons.org/licenses/by-sa/3.0/us/deed.en_US).